The Wu Tang Clan rapper stars in the latest ad for animal rights group PETA. You are what you eat, so if this cow who is stressed, dumbfounded, sick becomes your meal, when you eat it, you are eating that stress and sickness. You are eating that fear. That “you are what you eat” line was already committed to the annals of hip hop back in 1990, when KRS-One railed against the FDA and the meat industry in “Beef,” which RZA references in the video. If it’s been a while, it’s worth another listen—there’s a lot of complex content wrapped up in that simple rhyme scheme—but the essential message is the same: the way we produce and consume meat does a disservice to the animals and ourselves. 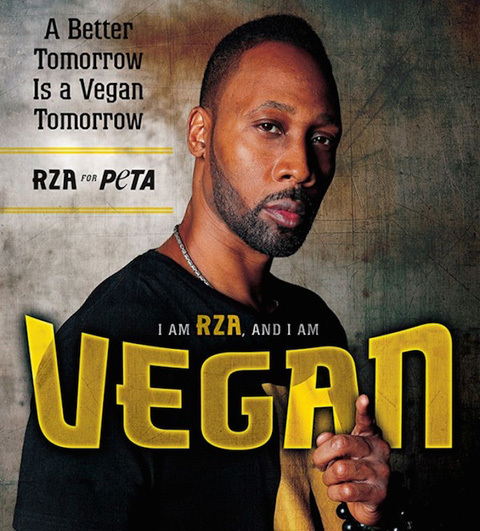 While RZA isn’t the first rapper with a PSA about lifestyle and wellness, neither is he the first rapper to plug for PETA. In 2012, Wacka Flocka Flame bucked the aggressive machismo of the hip hop world to cuddle puppies on camera and school us on being responsible pet owners. We’re 100% behind animal-friendly hip hop, especially if its results in more videos of rappers and cute canines sharing a frame. In the meantime, we’ll amuse ourselves with our favorite online game, Snoop Dogg or Real Dog?, and think about eating less meat.